LET'S BREAK THE U.S. BLOCKADE ON CUBA! Pastors for Peace US/Canada Border Crossing! An organizer with the Interreligious Foundation for Community Organization (IFCO) / Pastors for Peace who has helped to organize and lead numerous Caravans to Cuba, work brigades, relief efforts in Haiti and solidarity efforts with Honduras. He is currently studying at the SET (Evangelical Theological Seminary) in Matanzas, Cuba. JOIN THE 2014 PASTORS FOR PEACE CARAVAN TO CUBA! The Pastors for Peace Caravan to Cuba is a U.S.-based Cuba solidarity project that each summer brings humanitarian aid and U.S. citizens to Cuba to challenge the U.S. Blockade and travel ban against Cuba. Cuba solidarity organizations across Canada have supported the Caravan since the beginning over two decades ago. 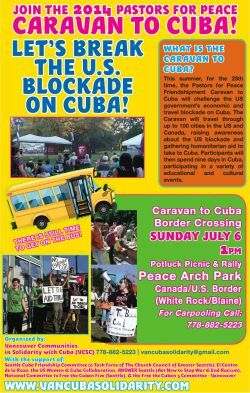 Cuba solidarity activists and Caravan supporters from across British Columbia and Washington State will once again join the Caravan by supporting the border crossing at Peace Arch Park. We will be bringing humanitarian aid and Caravan participants across the U.S/Canada border on route to Cuba! The Peace Arch border crossing has been the scene of several important recent victories against the U.S. Blockade on Cuba. Notably, the 2012 border crossing became an international event when U.S. border officials repeatedly attempted to deny our humanitarian aid from crossing the border. However, by launching an emergency media campaign, legal challenge and extended demonstration on both sides of the border we forced them to allow the aid through. We need a strong presence at the border to ensure our humanitarian aid will cross again this year!